Night-time dim-light exposure could make breast cancer spread to bone. Breast cancer patients, who expose themselves to dim-light at night, take note! A recent study has found out that dim-light exposure at night could likely lead breast cancer to spread to bone. A Study presented at Endocrine Society's annual meeting, ENDO 2019, has shown dim-light exposure at night may lead breast cancer to spread to bone for the first time in an animal study. "To date, no one has reported that exposure to dim light at night induces circadian disruption, which then increases the formation of bone metastatic breast cancer," said Anbalagan. "This is important, as many patients with breast cancer are likely exposed to light at night as a result of lack of sleep, stress, excess light in the bedroom from mobile devices and other sources, or night shift work." said Muralidharan Anbalagan, Ph.D., assistant professor, Tulane University School of Medicine in New Orlean. 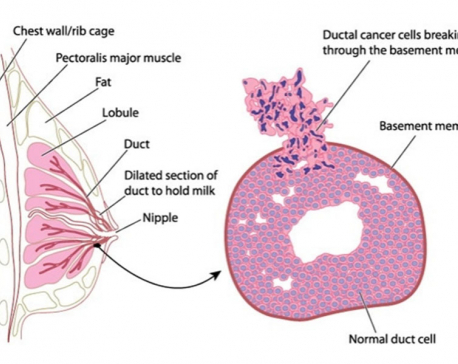 The researchers created a mouse model of bone metastatic breast cancer. They injected estrogen receptor-positive human breast cancer cells that have a low propensity to grow in bones into the tibia, or shinbone, of female mice. Like humans, the mice used in this study produce a strong night-time circadian melatonin signal. This night-time melatonin signal has been shown to produce strong anti-cancer actions and also promotes sleep.